I’ve been spending quite a bit of time on Google Plus lately. I know, I’m geeking out. But it’s quickly becoming my favourite social media platform these days. It’s an incredible way to meet new people, connect with prospective customers, and deepen relationships with your consumers - and more than on most social sites. I know a lot of businesses don’t quite get it. It is a huge site, and there’s always new features being added (hey, it’s Google). Even the features that are on it have so much depth, lots of businesses just don’t have the time to learn them all - and actually use them. That said, I keep seeing lots of mistakes by companies - large and small, being made over and over again. I thought I’d give you a rundown of these - so you won’t have to make them! Here are 10 top mistakes on Google+. Set up a business page if you using Google+ for your company. It helps your SEO! It’s really easy to set up a company page on Google+. It’s similar to making a business Page on Facebook in that you need to have a personal G+ to make a business site, you categorize your business, give your location (ah - VERY important for Google Places) and so on. 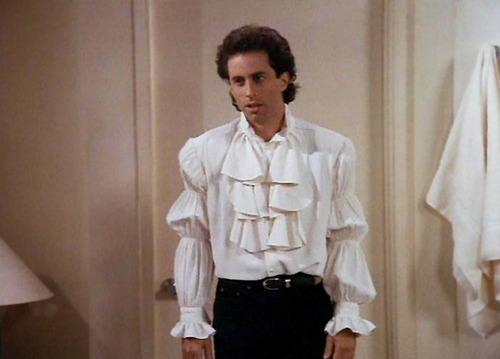 It’s ok to post as yourself too, but make sure your company is up on the site. Otherwise, you miss the opportunity to link back to it, reference it, and do all those kinds of things to raise your business profile, and SERP (search engine results page) ranking. Don’t miss the chance include your business keywords in your tagline and introduction. Google gives you the opportunity to include all your other social site links. Use it. Include your website, and location (particularly if you have a bricks and mortar store). All of this works to give you better SEO, to be found, and it makes you more marketable to your customers, as you describe your business. Here’s an example of a company on GooglePlus who have messed this up. They didn’t complete their introduction, or location. Their tagline does give you an idea of their business -but they missed the chance to communicate trust with their market, and give details of their products (with those lovely searchable keywords). They need to include who they are, what they provide, how to buy their wares, and where they are (particularly if they don’t have online sales). Use your profile to market your business. Describe your products or service. Include your location. You’ll get found on both G+ and - Google search. Do you hate this as much a I do? Don’t stuff your G+ profile with keywords only. This will not get you ranked higher for SEO. Keyword stuffing is a really old marketing trick. But it just doesn’t cut it with Google’s semantic search anymore. Google’s semantic search is a super huge, complex technical process. (Like, I can imagine thousands of super brilliant math and tech people dedicating their every waking minute to making search increasingly better for you and me.) But, in a nutshell, Google’s semantic search is trying to rank pages for their consumers (yes, Google has customers too - you and me - and everyone), based on the best quality, and relevant content. Google’s current (and ever evolving) search, kind of ‘reads’ your content, and sorts it for search. 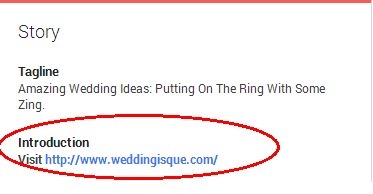 Stuffing your profile with keywords like: “wedding dresses, wedding dresses, wedding dresses” is just not cool anymore. Google reads this like we would. It’s spam. Write for your customers, using your natural descriptions. Pay attention to the details you provide, and include a selection of your product names, or services. Your consumers will appreciate it - and Google will too. A few months ago, Google+ had a design makeover. One of the significant changes included a larger cover image. You can’t load a cover image that’s less than the minimum 480 pixels wide by 270 pixels high. It’s better to use something closer to the maximum 2120 x 1192 pixels, so your image will be clear. Also, make sure your image scales to the right dimensions, and you take the location of your profile image into account. If you have the talent in-house, or the money to outsource it - get creative and make your cover image something to talk about. Check out cool examples like GE. Google plus allows you to segment the people you follow. For businesses, this means you can send out targeted posts to targets circles of connections you have. Yes, pretty cool. You can, for example, generate Circles for: in-store customers; online customers; partners; industry leaders; business friends; coworkers; etc. Make sure you use them. And then, make sure you use them well. 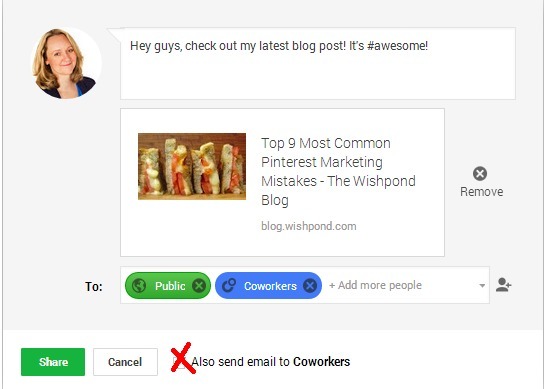 Write targeted updates to send out to targeted groups. 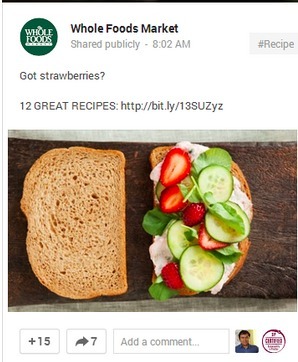 For example, Whole Foods frequently posts different updates linking to the same blog post on their website. If they had their Circles set up, they could get a bit more clever. They could actually direct their various G+ posts to specific, targeted markets. This update with “Got strawberries?” could be directed to ‘Public’ and ‘Extended Circles’ (‘Extended Circles’ gets your updates posted to Circles of your Circles). They could make other updates too, to send out to ‘Suppliers’, and any other targeted groups. Using Circles can extend the life of your updates (and blog posts), and can your them to resonate better with each of your segmented connections. 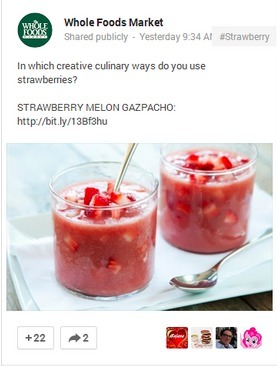 Circles are a great way to target your posts to reach your targeted consumers. Don’t overuse or abuse them. 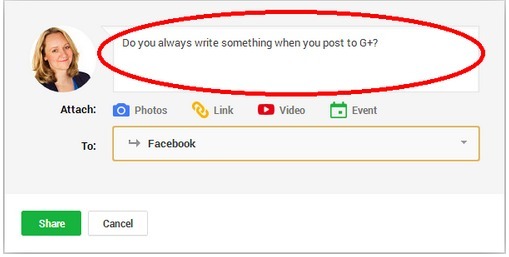 Like on Facebook, Google has algorithms for what posts get seen in your People’s news feed.The email option lets you make sure an important post will reach the Circles you need it to (like to customers, if you’re posting about a social contest marketing campaign, for example). But - don’t over-use this function! It’s particularly annoying if your Circles have not asked you for continual updates! It’s spam. If you’re using Google+, and you understand enough to be on it regularly - you’ll know not to do this social media faux pas. Social media is about interacting with your customers, networks and clients. People do not like to hangout with people who only talk about themselves. The same is true about getting updates from companies who are only posting about themselves. Remember the 80/20 rule in social media? 80% of your posts should be about lifestyle, customers and stuff other than you; 20% should be about you and your products. I would really think realtors would know better, given the emotional sale involved in buying a home. Why don’t they get that social online is like social offline? They’re still selling to their clients when they’re using social media. 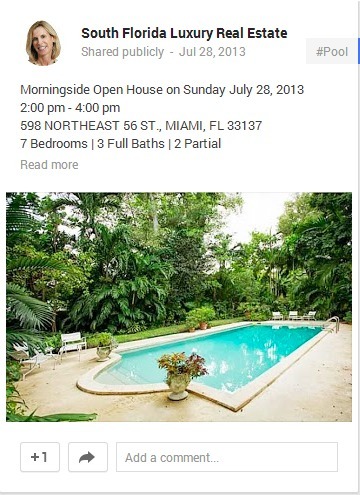 “Have you ever wanted the luxurious lifestyle of taking a cool dip in your luscious backyard pool surrounded by the privacy of full grown palm trees? With 7 bedrooms and 3 full baths, this could be the one for you. It’s social media, and your customers want more from you. Don’t just post your product on Google+, and then be disappointed when you haven’t sold anything. Another big no-no is not addressing negative comments on your posts. Bad comments will happen. It’s an open forum, and not everyone is going to agree with you, or even like what you do. As a business, it’s important that you keep monitoring all of your social sites. You need to judge how to respond to comments on your updates. It’s important to listen to your customer, right? You need to show that you do this. Address the concerns of your negative commentators quickly and smartly to avoid an escalation of negative feelings towards your business. A complaint about a product, ask them to email you so you can look into their specifics. A negative comment about your company, try to address their particular issues, to turn it into a positive. A nasty comment about your post, try to communicate. Communities are a huge part of what makes G+ great. Find communities that suit your business niche, and join them. Communities were introduced on Google+ in late 2012. They were kind of a response to Facebook groups, and to Twitter #hashtag communities, and maybe LinkedIn groups. Google+ Communities are growing quickly, and can be incredibly engaging. Basically, they are a way to find your niche interests online, and interact with them. Google will give you recommendations on Communities to join (based on your G+ updates), or you can search for relevant groups. There are Communities from Accountants on G+ to Z’s Proxy Factory, and everything in between. Oh yeah, and if you really can’t find your niche community yet - you can make your own and invite followers to join. There are a lot of small business groups, though (like Entrepreneurs, Self-Employed & Small Business, Small Business, and Social Media Trends for Small Business). So even if you’re not finding your customers, join a few business related ones - start to network, and you never really know where those connections will lead you. If you’re not using Communities, you’re missing out on an amazing way to connect with your customer online. Use them! But don’t abuse them by only posting spam, and only about yourself. Engage, share others’ posts, comment. Treat Communities like a networking breakfast, or trade show. These can be your customers! Give them respect and interest, and they will likely reciprocate! Last, but not least, I have to mention this pet peeve! Do not post a link - and not include at least a brief comment! Not only does this make you look thoughtless, these posts have low engagement. Posting an update with no introduction gives no motivation to read it, let alone +, share or comment on. To be successful in social media, you need to make an effort. Post with something interesting to say! Does this one go without saying!?! Make sure your product pages, blog post pages, website and other other relevant landing pages have an easy to click G +1 button! If you don’t have one, get your +1 Button now. Make it prominent on the pages you want shared on this massive social networking site. What do you think? Do you use Google+ for your business? What mistakes have you seen? Share them in the comments.